The Norwegian artist-duo Ingrid Book & Carina Hedén approach reality by means of documentation, inviting political and ethical questions of a more general nature. 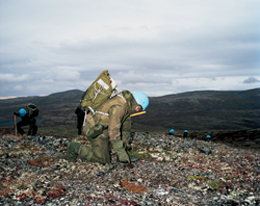 In their photo series Soldiers UXO-Clearance, 1-7 (2005) soldiers are observed cleaning a military training area in Norway from ammunition. While their ’characters’ are trying to erase an artificial element, Book and Hedén actually increase it, making explicit references to nineteenth-century realism with all it’s pathos and pictorial force. 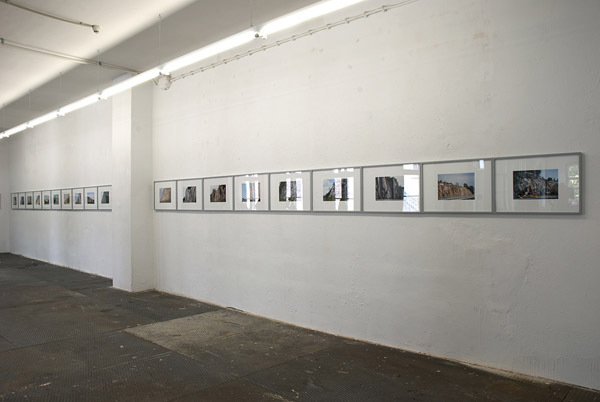 In their photo series, Produced Landscapes 1-45" 2009-2012, they show road cuttings i.e. blasted rock faces along the new highway between Sweden and Norway taken from a car in motion. The encounter between a slow geological process and a fleeting perception. An early theorist of motorways, Donald Appleyard, maintains that the course of a road ought to be planned with a sense of rhythm in mind. As if in a dance, views should come cascading towards us through the windscreen; objects should slowly grow bigger, and in a kind of climax for the driving spectator, one should pass select objects from an optimal angle – preferably because the road curves around them in a broad arc, before moving on to the next gradually expanding vista. Urban views would be preferable – landscapes of buildings, factory chimneys, criss-crossing flyovers, sometimes just the road itself, curving up towards the horizon – and in general he has something more magnificent than the Norwegian landscape in mind. For their exploration of road cuttings, Ingrid Book and Carina Hedén have chosen Scandinavia’s least spectacular stretch of motorway – the E6 between Gothenburg and Oslo. The road slices through a semi-industrial, agricultural landscape punctuated by brief copses of trees . This is hardly visually challenging woodland, but spinneys of low-growing birch or scruffy bush scrub. The lofty and very different pine forests we find up in Hallingdalen offer ever-changing views as they flash past. Glancing in among the tree trunks, one observes the rapid play of constantly changing spaces, forest floor and light. But not along the southern stretch of the E6. Here the carriageway is for the most part flanked by broad green verges of grass and weeds – with the exception of where it passes through cuttings; variations on the theme of blasted bedrock.  When you start looking for them, it turns out there are more than one would expect, cropping up at regular intervals. Some of them exert a curious attraction, with their neutral, beautiless appearance, often deeply marked by industrial processes – traces of blasting and splintered mountain. It is these road cuttings that Book & Hedén have chosen to show in their series Produced Landscapes. The pictures are taken from a moving car, always with a similar distance to the rock face. The stones have been blasted out using slightly different techniques on the Norwegian and Swedish sides – the Norwegian cuttings are often rougher than their Swedish counterparts, with drill marks conspicuous across the stone. These walls of rock are often topped with fences, while down below we can often make out motorway crash barriers. The thirty photographs capture the generic aspect of motorway cuttings – the typical rugged, rough rock face with an area of green below and trees up on top. The series reflects the repetitious, monotonous views we associate with car journeys – and it reflects a fascination with what is not necessarily beautiful. There is, however, always something appealing about series based on typologies. In depicting examples of different types of nature in his Atlas project, Gerhard Richter conveys a profound desire to say something about the way natural environments affect us and why we find them attractive. 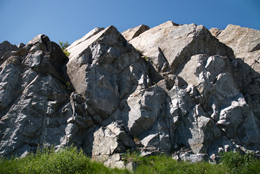 The same thing is true here – why are we drawn to these brutally blasted rock faces?